Not much sewing getting done this month. I was able to make my April BOM. I get more and more excited about this Designer Mystery BOM every time I make a block. I would like to ask a big favor of my readers. Would you help a friend of mine?? You see my BFF has a daughter that has been fighting a very aggressive cancer. My BFF made her daughter a beautiful quilt while she was in Alaska caring for her grandchildren. Her daughter has written a story about her mom in a little contest. And she needs votes. Can you take a minute and vote for Carlee's story at www.thymes.com . There is a $300 prize that Carlee would like to give her Mom. Her story is listed under Quilting Comfort by Alaska Mommy. Thanks so much for taking just a few minutes to help my friend win a much deserved prize. **** I think I have fixed the link. Thank you so much! 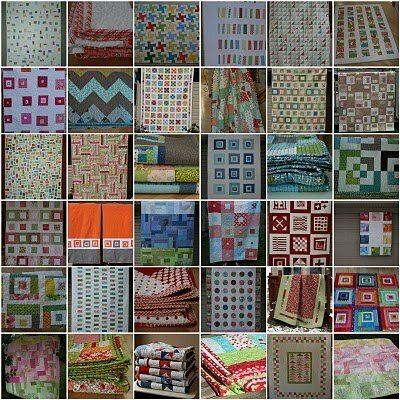 Welcome home Crazy Mom Quilts! Well just when I get the EQ6, the fabulous Electric Quilt Company comes out with EQ7!!! Digital cameras will become a quilter's best friend. EQ7 has dozens of ways to turn everyday photos into quilt ­­art images. Or crop and edit scanned fabrics right in EQ7 in minutes. You'll never run out of EQ7 activations! Activation and deactivation is as easy as two clicks of the mouse. Install on as many computers as you like and quickly transfer activations from computer to computer. This new policy gives you complete freedom to manage your own activation. EQ7 is the most user-friendly full-featured quilting software yet. Exactly the same friendly interface, plus loads of new user-requested features. Now how cool is all that? Are these people just fabulous or what?? Details coming May3rd! Buttons are such fun to collect! Please be sure to visit All Thingz Related! These girls have such a fun blog. She was my first rotary and I still love to use her when I am cutting fabric. I also find that my blades don't dull as easily when I use her sister mat. Well at least we'd like for there to be one. With everyone running off to these incredible national Quilt shows, we who are left behind have to make our own. Right?? And of course there are always quilts for sale. Sigh......... well if I am not able to go to Chicago, or Paducah or Knoxville, at least I can soak in the beauty here on the home front. And I recently found these blogs where vintage sheets reign. Please visit Amy at Sew & Tell. for more fun and creative projects! But I was so happy when the mailman put a couple of special things in our box yesterday. First was this very, very sweet card from my Blushing Rose friend Marydon. She sent me this lovely Birthday card and a little something inside. Isn't this the cutest little patchwork Angel? Thank you Marydon. Your thoughtfulness always warms my heart. And a couple of weeks ago, AllieKatMom had a Spring giveaway and the random generator picked my number! Yummy fabrics and yummy treats! Thank you Amy! What a delightful way to start the day! Have a great one. Do you use your quilts for things other then beds? We live in an older home, so sometimes I use quilts to cover areas that would normally not be seen. A few years ago I made this pattern. It was actually half of a pattern that was published in a magazine. It is the perfect size to cover the electrical box in our hallway. A friend of mine made a mini quilt to cover her breaker box. 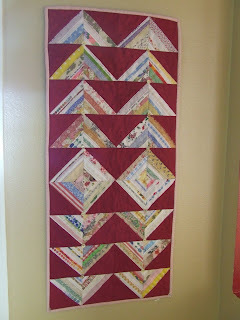 The pics are of the 36 x16 mini quilt I made to cover the breaker box in the hallway from the side door to the kitchen. 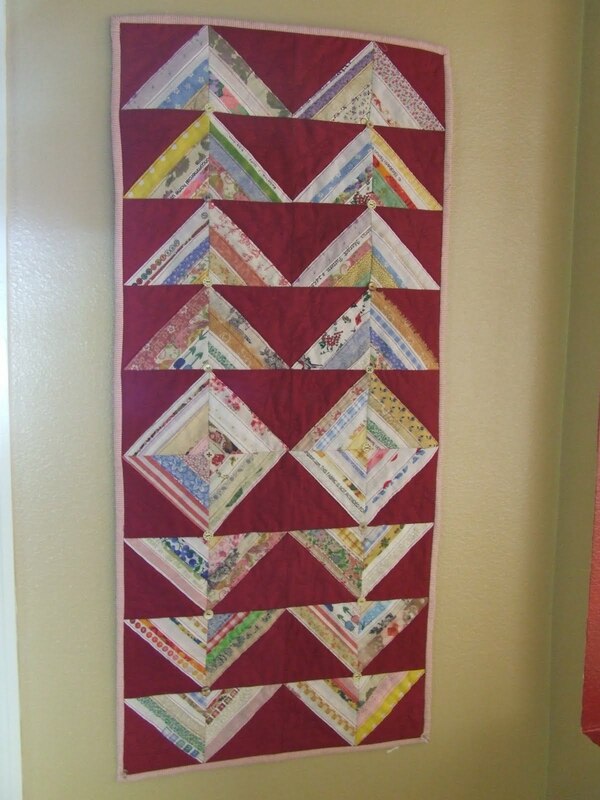 I did 4 inch squares of red and covered half of the square diagonally with light colored selvages! It was really fun and easy! Then I just had fun arranging and rearranging the 'half-square triangle squares'. Such a clever idea for using selvages. How do you use your quilts in your home?? Check out the other All Thinz Related posts. is celebrating their One Year Anniversary with wonderful giveaways for 30 days. It is not too late to sign up for all the giveaways so go to the site and get your name in for these wonderful products. There is only 4 days left of the promotion so don't wait too long. All giveaways from March 15 - April 15 2010 are open until 10:00 PM CMT. Readers can post on any of the giveaway posts they choose but comments need to be relevant to what question was asked for in that post. And today the prize is an AccuQuilt Go. Wouldn't that be wonderful to win! I recently purchase EQ6 from Kelly and her service was fast. Kelly has the MOST fun blog and her products are wonderfully priced. So, if you have never been to IHAN, be sure to stop by and pay her a visit. Now let's help Kelly CELEBRATE!!! A couple of weeks ago I flew across the big pond with my hubby. I have never been out of the country before so this was a very new experience. and buildings that have been standing, untouched, since the 1400's. hummmm....... let's see. Christopher Columbus was probably not even born when these buildings were built! Julie from Jaybird Quilts posted a question yesterday about whether we are working on a BOM. I am a month behind on my Fat Quarter Shop Designer Mystery block. Last month was very busy with activities and traveling, so I was not able to get my March block completed. and will be working on the April one soon. I really love the fabrics and I am hoping to be able to keep up each month, so I don't fall behind. I am joining Amy for Sew and Tell today :-) Please be sure to stop by and visit her blog. 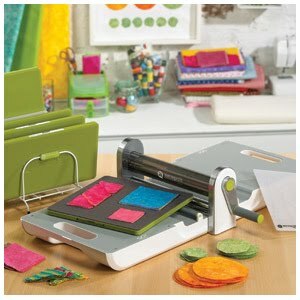 Hope you are having a happy quilting day!